Photo via Patrick Morrisey for Attorney General Facebook page. I had been meaning to point out to Coal Tattoo readers an important decision this week from the West Virginia Supreme Court (discussed here by the Gazette’s Kate White), because the ruling could impact the ongoing efforts of Attorney General Patrick Morrisey and other West Virginia officials to “take on the EPA” on behalf of West Virginia’s coal industry. The Office of Attorney General retains inherent common law powers, when not expressly restricted or limited by statute. The extent of those powers is to be determined on a case-by-case basis. Insofar as the decision in Manchin v. Browning, 170 W. Va. 779, 296 S.E.2d 909 (1982), is inconsistent with this holding, it is expressly overruled. — @Kenwardjr Do you have plans to retract all of the false articles you wrote about our authorities? While we believe the Constitution and case law precedent provide authority to the Attorney General to act in various circumstances, it would be premature and disrespectful to the Governor to discuss the specific sources of such authority (which would vary based upon the facts of a case) before meeting with the Governor and the agencies so that we can speak with one voice. As a state, the legal theories that we employ to defend our citizens will always take into account the facts of a particular matter. We anticipate having a very collaborative relationship with the Governor and the agencies to work together to put West Virginia first. The Attorney General was alluding to your statement that he refused to provide justification for his assertions related to the Office’s authority. In fact, the opposite is true. In November, Scott Will sent a copy of the 2002 Burton case to you, which outlines many of the activities that may be pursued by the Attorney General. No one is perfect, but when someone in good faith responds to a question, it isn’t right to say he hasn’t. The Attorney General relied upon the Burton case to present his perspective of how the Office might be able to act on myriad issues. The Supreme Court decision this week further buttresses everything the Attorney General has said. As you know, there has been a great deal of debate about the constitutional power of the WV Attorney General. The Legislature sought to restrain the AG’s authority in recent years, but the AG’s authority ultimately flows from the Constitution. We are not going to get into this before there is even any dispute. But the case law provides opportunity for the West Virginia Attorney General to act in certain situations, especially when he is not expressly preempted by law. Depending upon the factual situation, part of the holding of a case such as ex rel McGraw v. Burton might be cited regarding the AG’s authority. But unless there is a dispute, it is premature to raise these issues. Now, why in the world Scott Will thought that part of his email should be “Background and Not for Attribution” is beyond me. I’m just not so sure what is so secret squirrel about it, especially if the Morrisey camp wanted me or anybody else in the media to say that they were hanging their hat on the McGraw v. Burton case. What’s all this got to do with anything? Well, quickly: There’s been a very long-running legal fight in West Virginia over exactly what authorities the Attorney General has, and what the AG’s office relationship is to other state executive agencies. One of the major cases on the matter was called Manchin v. Browning, and it held very clearly that the West Virginia Attorney General “does not possess the common law powers attendant to that office in in England and in British North America during the colonial period.” This ruling has been cited by those who have tried to limit the Attorney General’s powers, especially when Democrat Darrell McGraw held that office. The inherent constitutional functions of the Office of the Attorney General of the State of West Virginia include: (1) to play a central role in the provision of day-to-day professional legal services to State officials and entities in and associated with the executive branch of government; (2) to play a central role in ensuring that the adoption and assertion of legal policy and positions by the State of West Virginia and State entities, particularly before tribunals, is made only after meaningful consideration of the potential effects of such legal policy and positions on the full range of State entities and interests; (3) to assure that a constitutional officer who is directly elected by and accountable to the people may express his legal view on matters of State legal policy generally and particularly before tribunals where the State is a party. We are pleased with the ruling by the West Virginia Supreme Court of Appeals today. It is arguably one of the most important decisions outlining the powers of the Office of the Attorney General in the past century. It reaffirms the role and common law powers of the Office as guaranteed through the Constitution and strikes down a bad decision written decades ago that unnecessarily limited the Attorney General’s ability to perform his job. This decision also reaffirms everything we have said publicly about our plans and goals for the Office. As part of today’s 5-0 decision, the ruling ensures the Office will continue to have the ability to prosecute consumer protection cases in an effective and efficient manner. A long time ago, I said we would fight to protect consumer protection, and this ruling gives us the ability to do just that. We will stand strong for consumer protection and challenge any entity that threatens the interest of our state. As for AG Morrisey’s twitter criticism of my coverage, I’m still not sure exactly where in my print story or either blog post I wrote that he was wrong about what authorities the office has. But I am all for public officials and just normal people using social media to criticize the press when they think we get it wrong. And if AG Morrisey believes I don’t believe in being transparent and minimizing errors in my reporting, he just doesn’t know me very well. His staffer, who sent the email, directed you to Burton as the reason the Attorney General believed he had authority to represent the states interests independently * even though the Attorney General prefers to have West Virginia speak with one voice whenever possible. 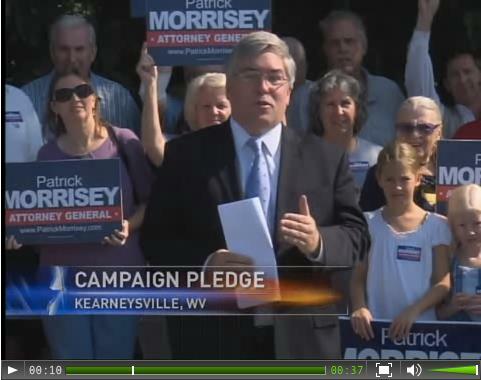 You said that Morrisey wouldn’t explain what in the Constitution, WV Code, or case law gave him authority to meet his campaign promises. However, his staff provided you with the very case that backed up his assertions. The case is a public document, which would allow you to follow up on the answer and verify that the Attorney General had a good faith reason for making his statement (which of course has been reaffirmed again recently). But I wasn’t trying to write a law review to explain the current state of the case law on the subject. I was just trying to get a newly elected public official to explain exactly what his argument was for how he had authority to do what he’d promised voters he would — something that, unfortunately, didn’t get a very full discussion by state media in last year’s AG campaign. And it doesn’t make much sense to me for AG Morrisey to now expect me to have quoted one of his campaign aides saying something that the campaign aide insisted was for background only and “Not for Attribution.” If the Morrisey campaign wanted to say they believed McGraw v. Burton gave them authority to “take on EPA” they could have — and should have — simply said that. Every day, we look for new ways to take on federal overreach.